Carthusia Capri Forget Me Not Shower Gel is an uplifting body wash fused with the natural essences of fig, vanilla and mint. This refreshing combination delivers a truly magical showering experience, leaving the skin clean, soft and smelling wonderful. Capri Forget Me Not is a collection of exquisite products that evoke pleasurable memories of Italy's majestic island. 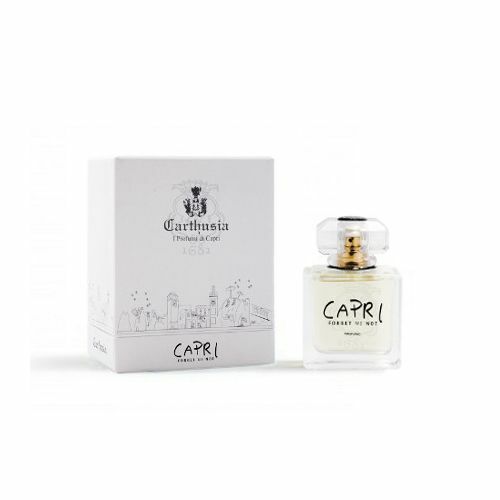 Carthusia Capri Forget Me Not Shower Gel comes beautifully packaged in Carthusia's luxury wrapping. The black and white sketch on the front of the bottle renders showering under a fig tree, illustrating the natural, fruit-rich ingredients. Massage Carthusia Capri Forget Me Not Shower Gel onto damp skin and rinse.